Do not place the controller by outside heating sources such as heaters, lamps, windows, vents, etc. Do not use the warmer with infants, children, invalids, or people who cannot control the device by sensing the heat and adjusting it themselves. Do not sleep on the device. 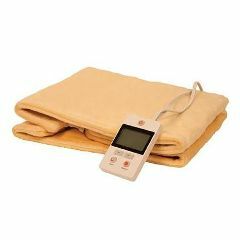 This moist heat warmer is designed to cover the full back, neck, and shoulders to warm and prepare tight muscles for massage. The pad delivers heat smoothly and evenly and is certain to be a favorite of yours and your client. Digital central unit allows for specific temperature setting of up to 166 º. Extra large display and auto shut off feature. Includes flannel cover. Patent Pending. There is an auto shut-off for safety. The power cord should be inserted into the heating pad. The plug should be inserted into the wall. The display will light up for a few seconds indicating that there is power to the unit. The button at the top of the unit is the main power control. Press this button to turn the pad on. The default pad heat setting is to reach mid temperature and activates a 99 minute timer. The + and " buttons can be used to increase or decrease the heat intensity. The preheat button can be pressed to increase the heat setting to maximum heat. 60 MIN" (minutes) will display in the lower right corner telling you the pad will be on for 60 minutes in preheat mode. It is advised that once your pad reaches the desired temperature, you use the + or " buttons to set the ideal temperature. Doing so will turn off the 60-minute preheat timer. The unit is equipped with a sleep timer that can be adjusted in 10 minute increments, up to 99 minutes. The pad will turn off automatically after this timer expires.